I'm home after Celebration Europe in London. I will be honest and say that it wasn't my best Celebration. I don't know, it was what I expected, but nothing more. I still had a great time though, and I love Celebrations and I'm really looking forward to the next one. Two things that helped bring down the feeling was the lack of panels. The main panels were super awesome, but I missed the interesting smaller panels that you can slip into and listen to people really talking about the minutiae of Star Wars. 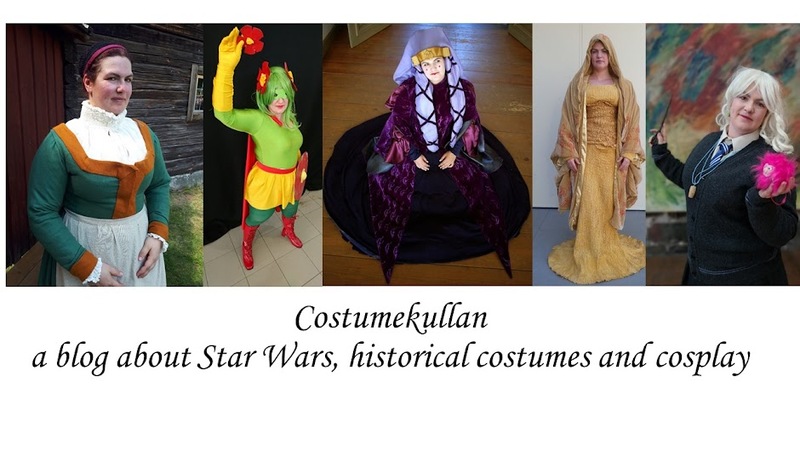 There was a Star Wars archaeology panel, but I missed it due to the Cosplay Contest. 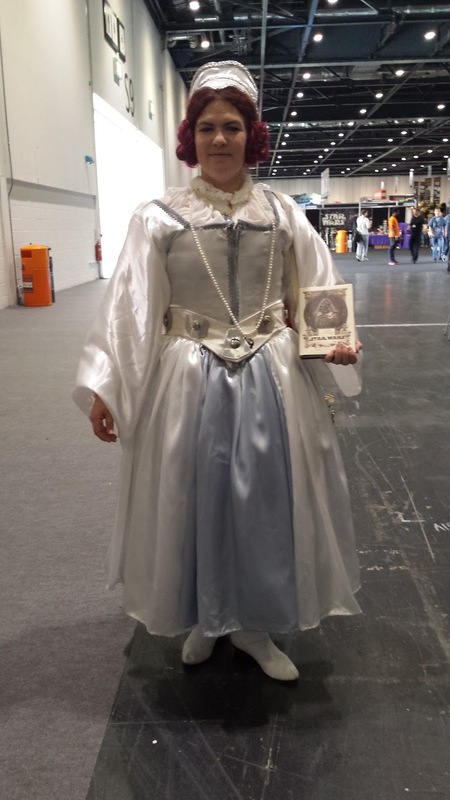 I will probably make a separate post on the cosplay contest, when I can find more photos from it, since I didn't take any myself. I don't have any photo of myself for example. Friday was mostly spent with costume contest preparations. I was happy that I did have time to get changed and take part in the running of the Hoods. 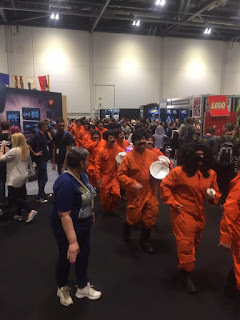 This photo, with yours truly in the biggest beard, biggest moustache and smalles ice cream maker, was posted on the official SW Celebration account. The running was a lot more exhausting than I thought it would be. Sure it's in slowmotion, but the venue was hot, and I was dressed in winter boots, a big wig and a moustache. My glasses was totally fogging up. 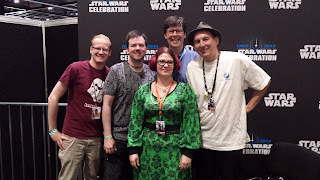 It was superfun though, we photobombed en masse, and got photobombed by Ray Park as well, and were up on the Star Wars live stream scene, I can't find a video of that though. 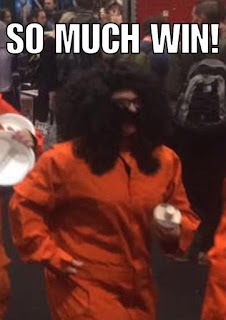 My outfit was even noticed enough for someone to make a meme of it. On Saturday I was on a panel about international Star Wars fandom, talking about how you can start your own fan clubs and what can work and not work. 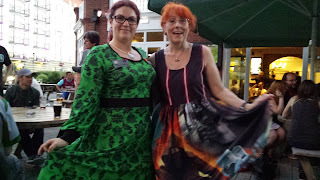 It was all about the aspects of fandom that aren't about costumes or collectables so I chose to go in my Greedo dress. I added some buns, but I didn't get them to look that great. Also my own hair has faded a bit too much compared to when I bought the fake hair. The panel meant that I missed the legions photoshoot since that was also on Saturday morning, but I hadn't brought any approved costumes with me, except for the handmaiden, anyway. 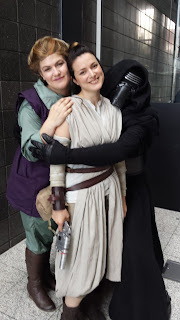 For Saturday afternoon we had dedided to try and get a group of us with TFA costumes to meet up. 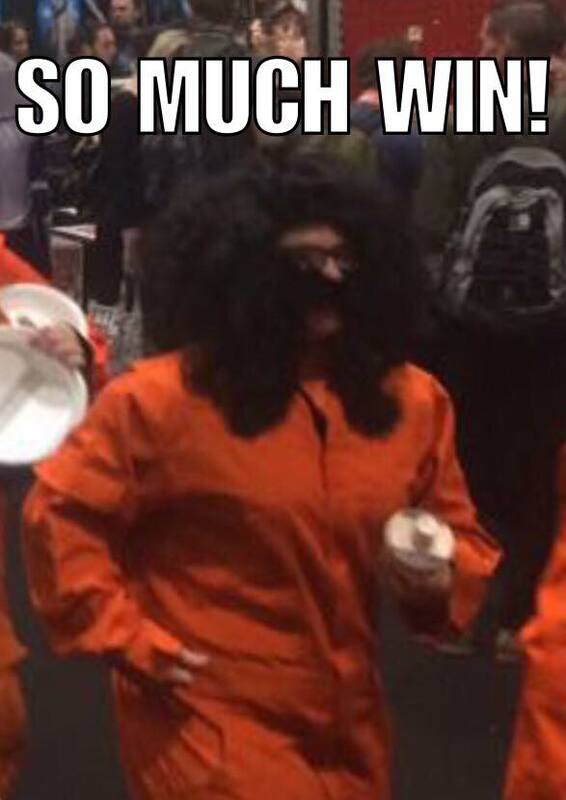 Unfortunately that didn't go as planned, so at the time and place where we had set up, only me as Leia, Jazz as Poe and Jokke as Kylo showed up. They did play up the TFA scene between Kylo and Poe, and it ended up on the fan tribute at the closing ceremony. The photo above is a screen grab from the Youtube video and you can see me in the background as Leia. 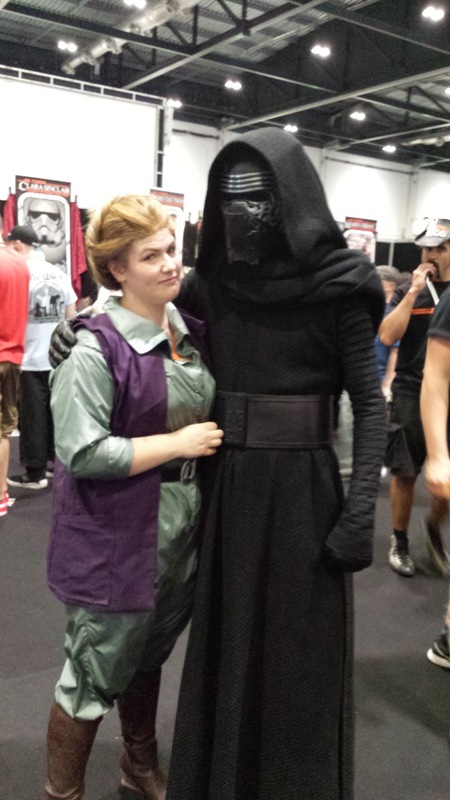 We took a stroll on the floor as well, but people only wanted photos with Kylo/Rey and our Nien Nunb, who was the most popular of all! In the evening it was the 1force bash, which was a party for members of the 501st, Rebel Legion, Galactic Academy and JediNews. 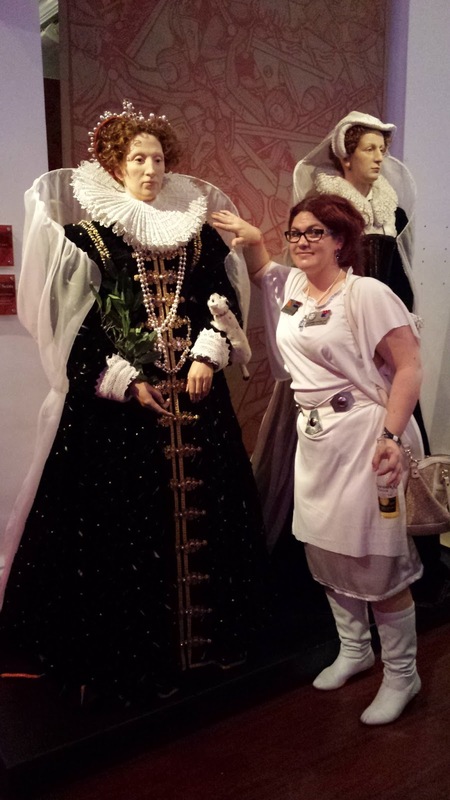 It was held at Madame Tussaud's, and it was great seeing the place. At the same time it wasn't my kind of museum, so it's not something I would have liked to spent Money on, if it hadn't been for the fact that I was at a party with a bunch of great people. I was more interested in the Royals than the celebrities though. Finally on Sunday it was time for me to wear my Shakespeare Leia. I'm so satisfied with the costume, it was warmer than expected though, I guess that's what you get for using polyester satin. I had been lucky to get a time slot for "Trial on Tatooine" a virtual reality prototype on Sunday though, and in order to do that you need to wear a headset/goggles and headphones, so that totally ruined my hair. 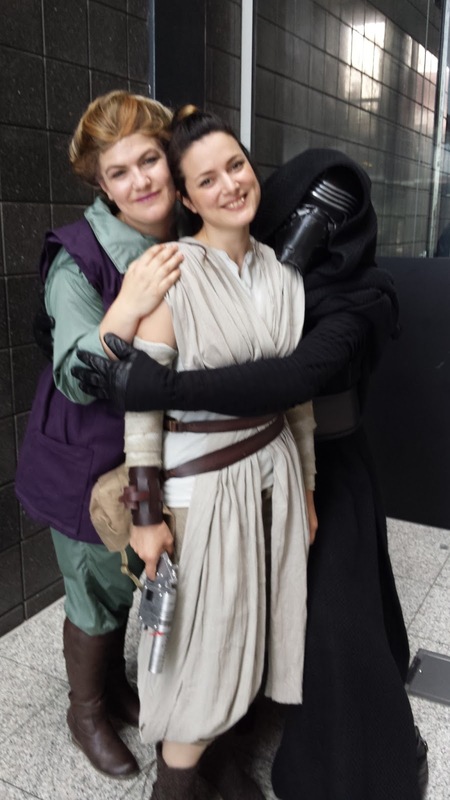 It was my second highlight of the con though, it was so cool standing on Tatooine and yielding a lightsabre. I went back and changed into the Greedo dress for the rest of the day though. 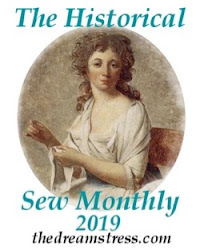 For the next Celebration I have decided that it's not worth trying to pack a lot of heavy and complicated costumes, so I will see how light and easy I can make it. The only way I'm going for a big costume is if I can get into a coordinated group of some kind, since being a group of costumers is a lot more fun than being alone on the floor.